As you might recall if you read my recent account of two days in Panama, I visited Peru with MT Amazon Expeditions in late January and early February, 2016. I had already been twice, in 2013 and again in 2014. This is a part of the world you could visit every year for your entire life and still find new herps each time. Here's the whole gang from this year's trip. 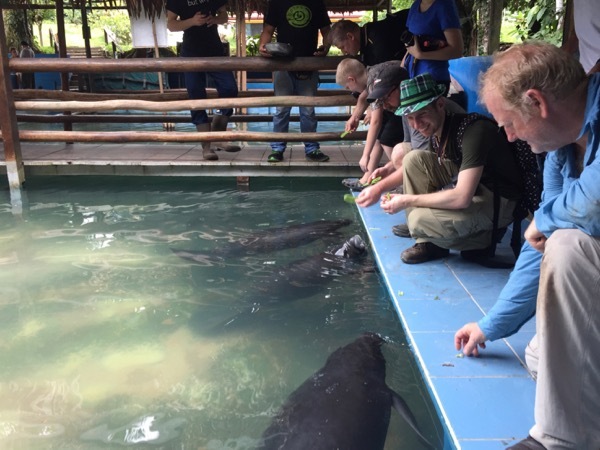 The six travellers from the Panama pre-trip were joined by Ben from Colorado, Michael from Georgetown, Queensland, Lorrie (part owner of MT Amazon Expeditions), Cliff from New Jersey, and Tom from London. Standing, left to right: Matt, Ryan, Joe, Hayley, Kevin, Ben, Michael, me, Lorrie, Cliff, Tom. Kneeling, left to right: Emerson, Edvin, Cesar, and Raul the cook. But this picture is jumping the gun a bit. 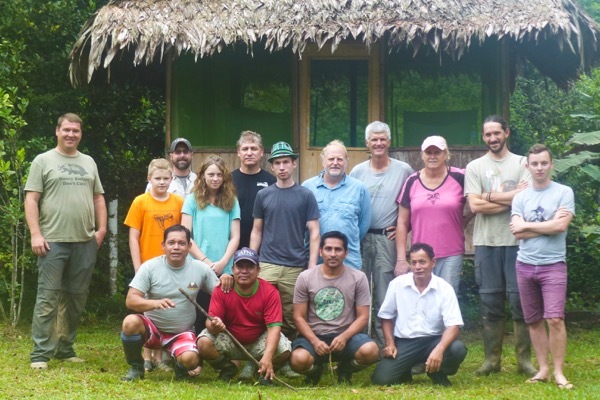 Before we rode a motorboat down the Amazon to reach the two field stations where we enjoyed the company, cooking, and herp-finding skills of the kneeling folks in the photo, we spent a full day in the relative metropolis of Iquitos. This post is only about that one day. After a fine breakfast at Ari's Burgers, we hopped onto the ubiquitous mototaxis and headed to the Quistacocha Zoo. The zoo is an excellent place to herp, and I am told that they have some zoo animals also. 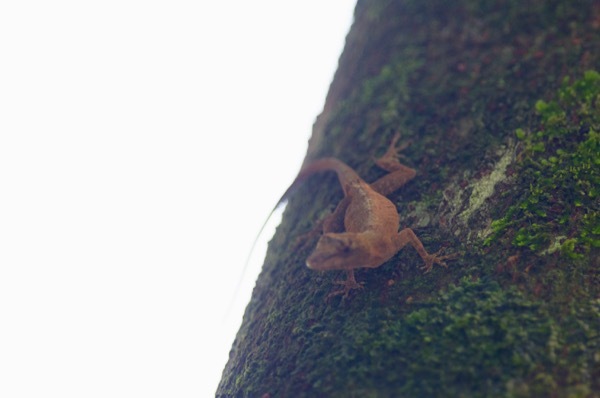 The first official herp of the day was an anole in a tree just outside the zoo's ticket booth. Some people got good photos of it, but I was not among them. I did get a crappy photo though. 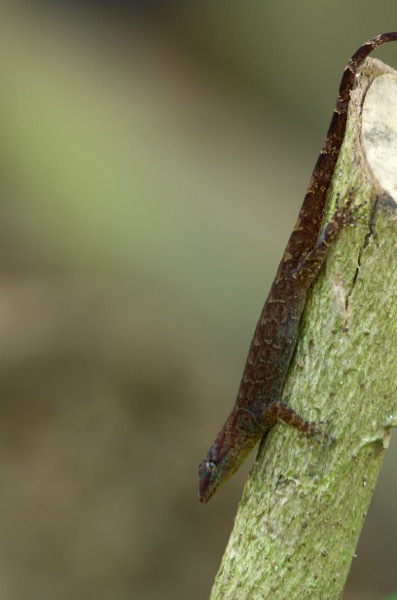 The most commonly seen herps on the zoo grounds were little diurnal geckos. I think all the ones we saw at the zoo were the same species. 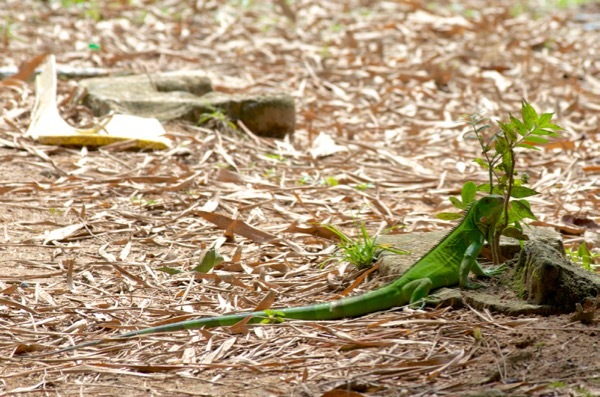 A few iguanas wandered about. One of our main targets for the afternoon was the Giant Ameiva a.k.a. 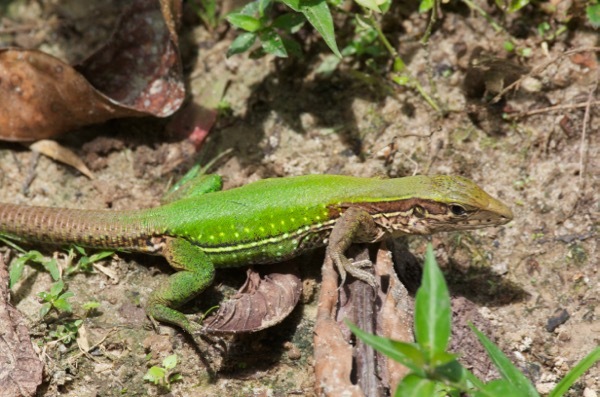 Amazon Whiptail. 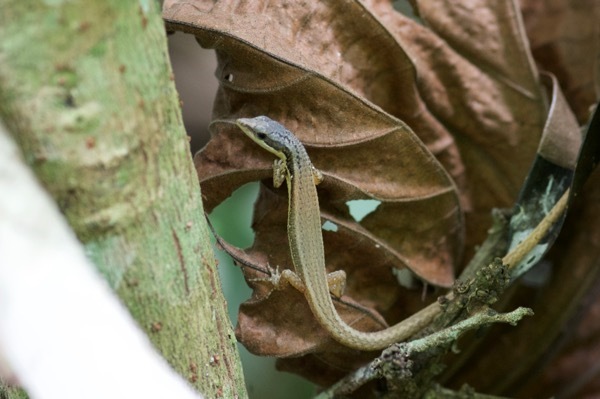 These attractive lizards are pretty easy to find at the Santa Cruz field station that we would be visiting, but they tend to be very hard to approach there. At the zoo they are habituated to visitors and it's easier to get decent photos. They are still pretty skittish, but if you hang out in the right area long enough one will eventually sit still in the open for a while. 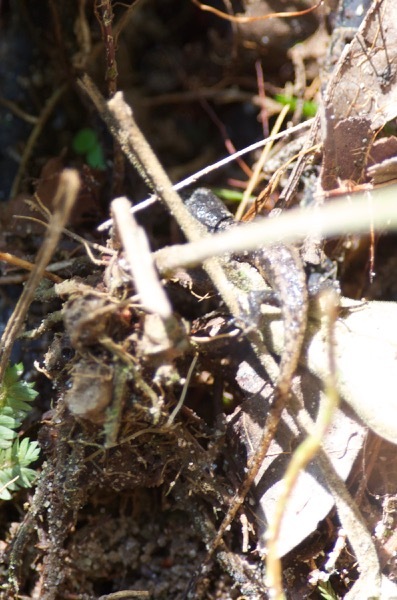 I spotted a tiny lizard and got one terrible photo as it was disappearing into a tangle of roots and leaf litter. 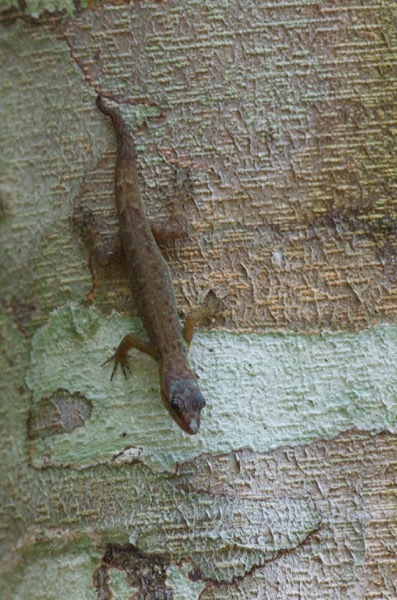 My best guess is that it was a juvenile Black-bellied Forest Lizard, but as I did not actually inspect the color of its belly I cannot be certain. 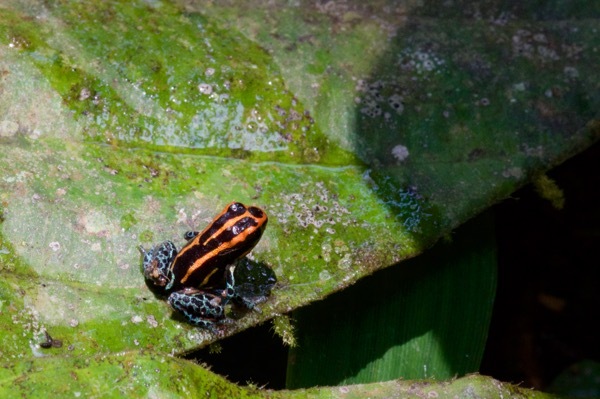 Our top goal for the zoo was to find a species of poison dart frog that Matt and Lorrie had seen there on earlier trips, though not for a number of years. Soon enough, someone (I'm not sure who gets the credit, but it wasn't me) did spot one of these brilliant little jewels, perhaps a half inch long. We all gathered 'round and took our time taking photos. While we were taking our time with this frog, Ryan got bored and wandered a short distance away, where he found an even smaller one. 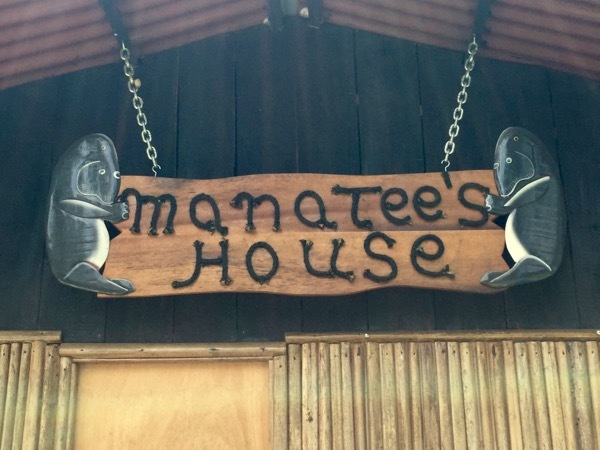 After the zoo we headed to the nearby Manatee Rescue Center, because, well, manatees. Unlike their larger Florida cousins, Amazonian manatees live entirely in fresh water. They most certainly do not live in wooden houses. On the way out of the Manatee Rescue Center a small lizard caught my eye, and I his. 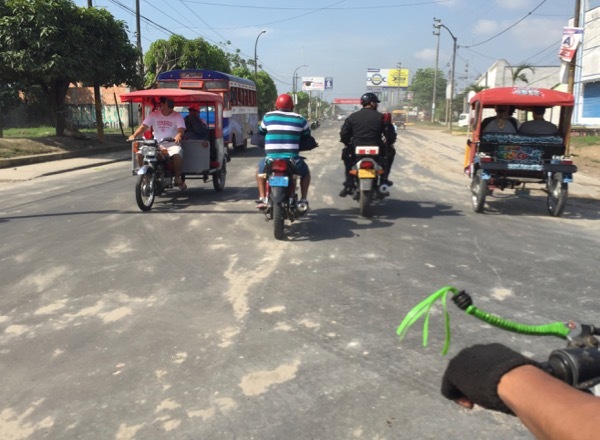 In the evening it was time to road cruise, Iquitos style. We rented a bus, complete with driver, and took turns sitting near the front as we drove the Iquitos-Nauta Road, the only non-trivial road in the area. Depending on the weather, the traffic, and good old-fashioned luck, this road is sometimes fruitful and other times not so much. 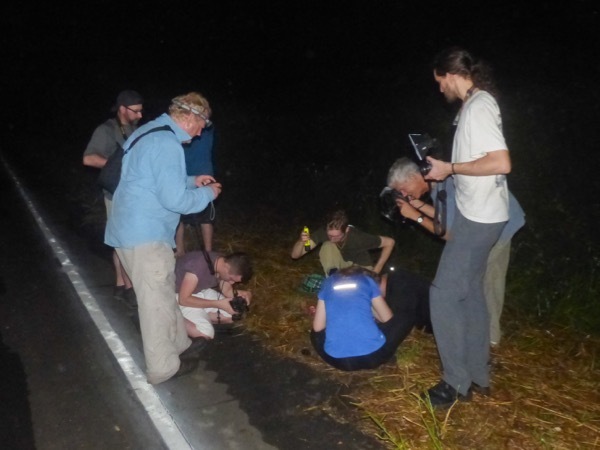 At first most people were hoping to find a bunch of snakes, but after a significant snake-free interval we realized that if we didn't stop for frogs we might end up not stopping at all. So stop for frogs we did, though not without occasional arguments about whether a particular half-seen anuran was worth further investigation. Here are some that made the cut. 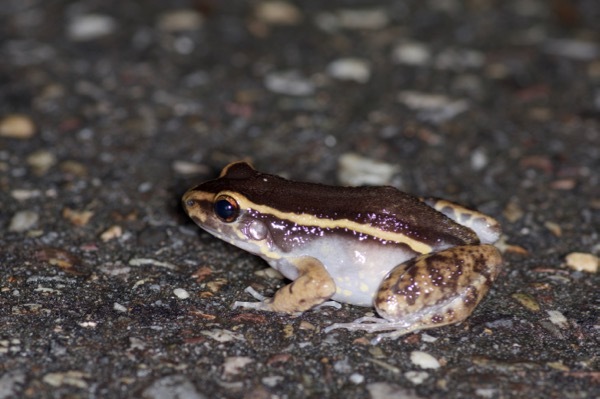 Smoky Jungle Frog (Leptodactylus pentadactylus). 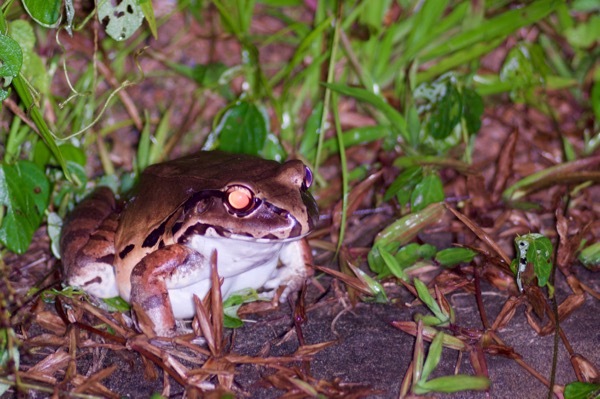 It is very difficult to get a flash photo of one of these immense frogs that doesn't have a terrible case of red-eye. 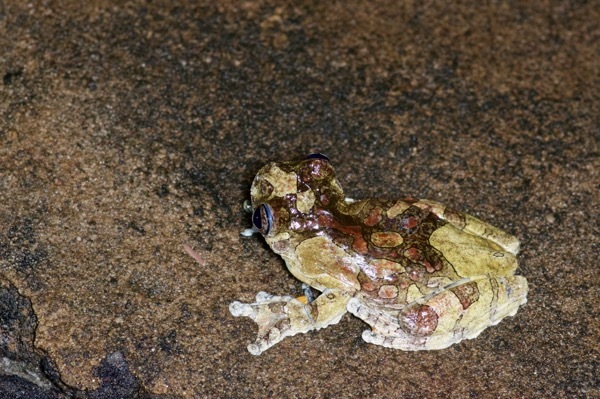 Rocket Treefrog (Hypsiboas lanciformis), with a non-red but still horrible eye reflection. I've taken lots of photos of these frogs without any weird eye reflections, so I'm not sure what was going on here. Maybe some day I will learn how cameras work. 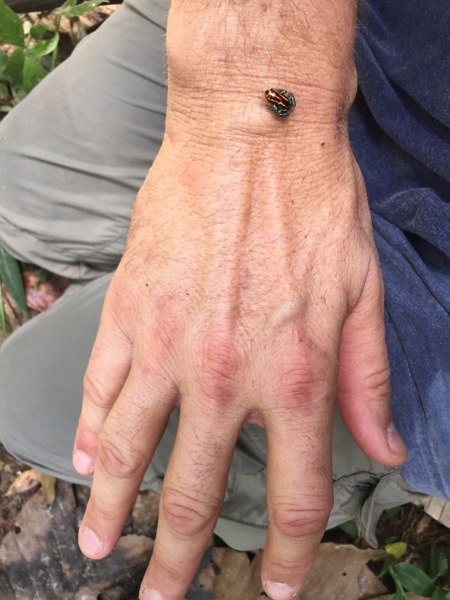 Painted Antnest Frog (Lithodytes lineatus). 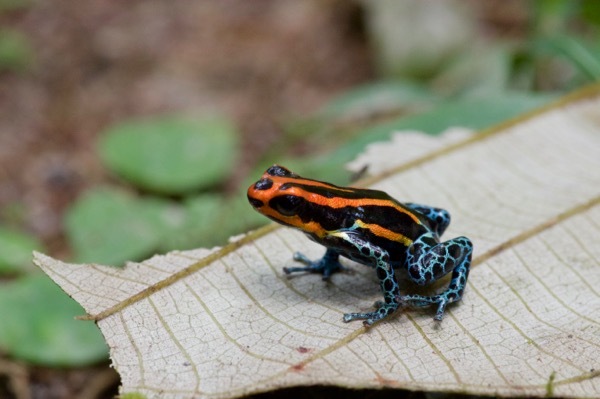 This species is considered to be a dart frog mimic, but very large individuals like this one (maybe three inches long) are quite distinctive and un-dart-froggish. 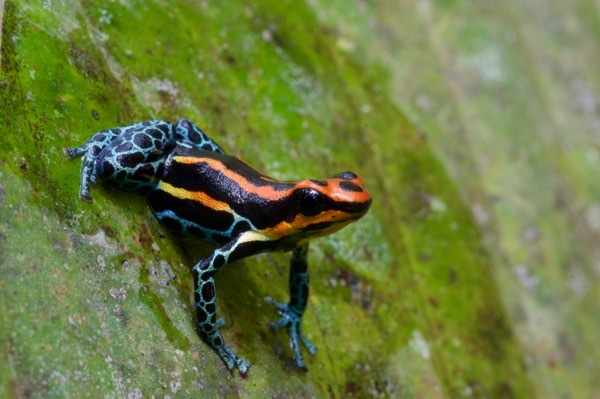 Marbled Treefrogs (Dendropsophus marmoratus) have beautiful swirly patterns on top and brilliant colors beneath. 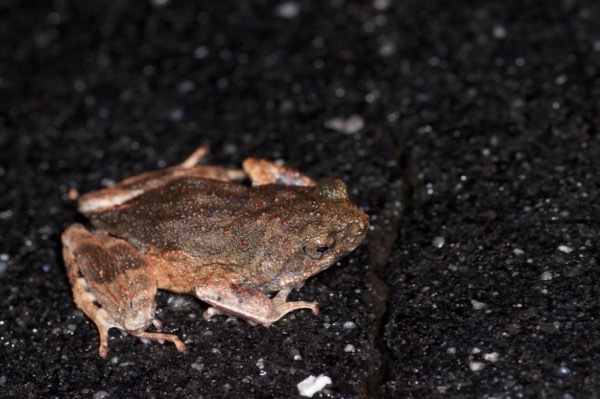 Painted Forest Toadlet a.k.a. 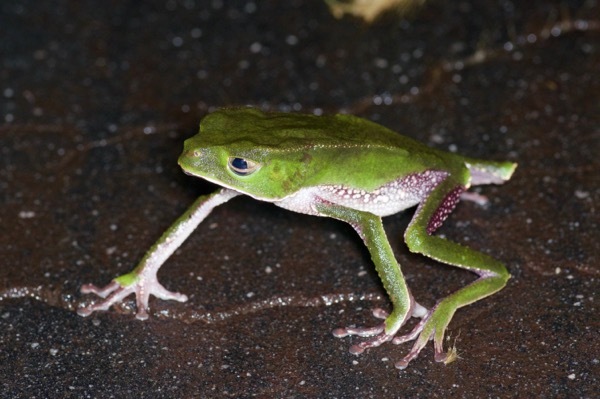 Peters' Dwarf Frog (Engystomops petersi) is an oddly proportioned frog, looking like a very small long-legged toad. 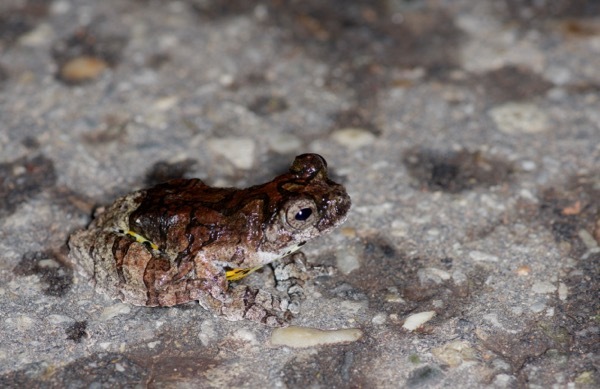 This was my favorite frog of the night, because it was the only one I hadn't seen before. 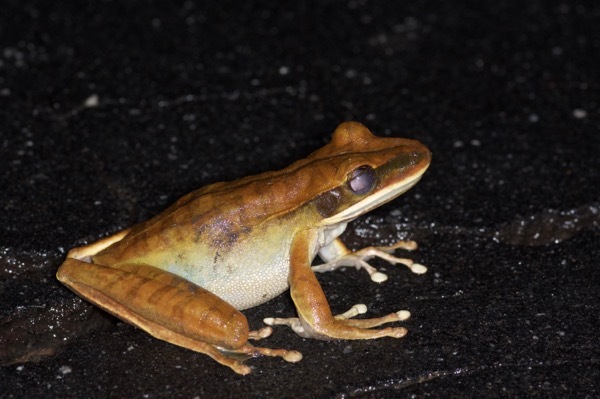 Speaking of oddly proportioned, a normally arboreal White-lined Monkey Frog (Phyllomedusa vaillanti) was holding this pose at the edge of the road. We did end up seeing three snakes, but only one of them was alive. I didn't take photos of the two dead ones (Anilius scytale and Atractus latifrons). 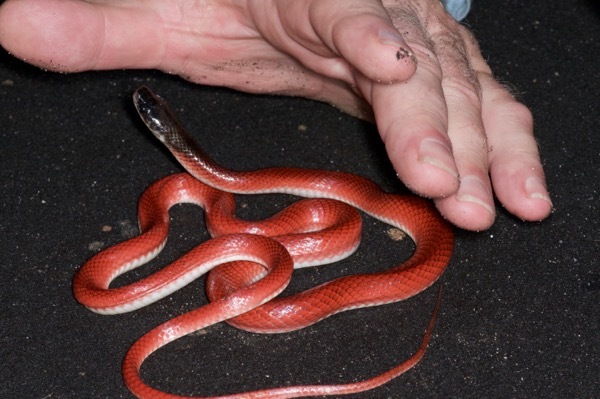 The one that was not dead was a brilliant red and extremely uncooperative Amazon Scarlet Snake (Pseudoboa coronata). We all gathered around it for at least fifteen minutes using various techniques to unsuccessfully encourage it to sit still for a few moments. First we tried to get it to pose in the roadside grasses. Photo by Matt Cage. Eventually we gave up on that and tried to get it to pose on the road, which was slightly more successful. I did get a few OK photos of the snake by itself, but this one is my favorite since it best reflects the actual events. The next morning we said goodbye to this obscure concept of "roads" and headed downriver to our first home away from civilization, Madre Selva Biological Station.